Sign up for a 6 or 12 month contract and receive 20% the price of each ad! I’m a big fan of history in general, especially old buildings. There’s a feeling of worth and solidity I get when I stare up at a brick facade stamped with some early 20th century date. I think of all the people that have come and gone over the years, all the stories that have been told within their walls. It reminds me that there used to be a time when we built structures with pride. That’s why we used to stamp the date in them; it was the hope that centuries later the bricks would still stand, that our descendants could look up and wonder about what life was like in the past. This week, we will see the train depot re-open officially. I was so glad to see this structure saved, instead of bulldozed and lost. I am equally glad to see projects like the Heartwood Center, the Belwood Building, and the Nesbitt-Tanner House. I give my kudos to those who choose to preserve history instead of eradicating it. There is no better way to honor a community than to preserve the memory of how it was formed. 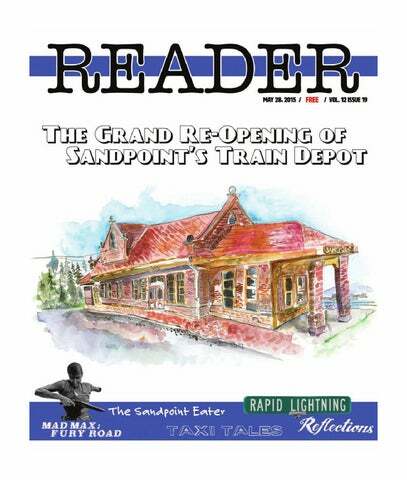 The Sandpoint Reader is a weekly publication owned and operated by Ben Olson and Keokee. It is devoted to the arts, entertainment, politics and lifestyle in and around Sandpoint, Idaho. 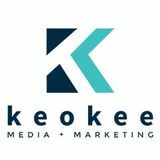 We hope to provide a quality alternative by offering honest, in-depth reporting that reflects the intelligence and interests of our diverse and growing community. Fri. May 29 @ 6:30 p.m.
BRANDON WATERSON Sat. May 30 @ 7 p.m.
PATRICE WEBB BREWERY & BEER HALL 220 Cedar St. 209-6700 FAMILY FRIENDLY BREWPUB 312 First Ave. The Reader is printed on recycled paper using soy-based ink. Leftover copies are collected and recycled weekly, or burned in massive bonfires to appease the gods of journalism. pened to be loaded down with thousands of dollars worth of cannabis, hash oil and various amphetamines. I believed the girls that they didn’t know the drugs were in there, and apparently so did the Mounties. They let them go scotfree minus a van and a camping trip. I can’t believe, however, that the Germans were that dumb to think a ‘70s van from Orange County driven by two hippy chicks named Teal and Saffron (not their real names, but they were named after a color and a spice) would get through the border just fine. Maybe they missed those huge red flags due to cultural nuance. Who knows? Regardless, those Germans left two very bummed girls in their wake—girls who just wanted to camp and experience the woods. It was their first time in the Northwest, and they didn’t see much of what this beautiful area has to offer. So like any good taxi driver, I bought them a six pack and made a pit stop at Tubbs Hill in Coeur d’Alene to watch the sunset over the lake. It wasn’t much, but it was the prettiest thing they’d seen yet. The beer, by the way, was Becks—maybe a little ironic, but I thought it paired perfectly with North Idaho charm. In a business that often wears on you and has its share of unruly customers, it sure can mean the world when you feel like you’re helping good people at the end of the day. That’s especially true when it’s at the end of a long haul. I hope all y’all’s long hauls end well and safe this summer, too. And remember, when you’re preparing for your road trip, check your air pressure, stock up your snack supplies and remove your billy clubs and drugs. saloons have occupied the bottom floor, while hotel rooms upstairs have been rumored to have served as brothels. There is even a popular story going around about the building being haunted by the ghost of a girl. “You’re supposed to say ‘hi’ to her and let her know you’re friendly,” said Alvearie. Ghost or not, The Bernd Barrel Public House plans to open around the second week of June. Check it out at the W.A. Bernd Building at 311 N. First Ave. in downtown Sandpoint. cality that’s implied by the description. Meanwhile Lindsay Lou and the Flatbellys brings exceptional musicianship and terrific vocals into one great package. The show starts 7 p.m. Friday at the Panida, and tickets cost $10 in advance or $12 at the door. For more information, check out Patrice Webb’s article in last week’s issue of the Reader, or read it online at www. sandpointreader.com. visitors enjoy sports courts, open grassy stretches, picnicking and barbecuing areas, playgrounds, food concessions and more. The city has built up the park and its features over time through funding from local, state and federal sources as well as grants. Before the beach is filled with families, students and tourists looking to make the most of their summer, it needs to be prepped for use. That means a lot of sand redistribution is in the cards for city staff once spring rolls around. Lifeguards are timed to man the beach right around the time school ends in early June, guaranteeing safe fun between 11:30 a.m. and 6 p.m. Another popular destination, Lakeview Park receives its share of attention, too. Smaller than City Beach at 12 acres, the park still features many similar assets, including picnicking facilities, event venues and boat launches, to name a few. A portion of the park is maintained by the North Idaho Native Plant Society, which runs a native plant arboretum out of the area. On the west end of town, Travers Park helps put the recreation in Sandpoint Parks and Recreation. Opened in 1986, the 17.8-acre park hosts one of the area’s most robust sports complexes, with enough courts and field to sate any number of athletic interests. Readying the parks for pleasant weather coincides with planning the Parks and Recreation Summer Activity Guide. A robust catalog of events to keep kids and adults busy throughout the summer, the guide is a project that takes months to complete. It was something of a relief, then, when the guide finally published on May 16. Find it online at www.cityofsandpoint.com/parksrec to start planning your summer agenda. At 110 acres total, Sandpoint parks are no small responsibility. But for Woodruff and many others, all the trimming, mowing and irrigating are more than worthwhile. Sandpoint summers are the months that make up childhood memories. They host the experiences that burn into tourist memories and keep them coming back. For department staff, that in itself is its own reward. and transformation into the Heartwood Center, a local events center. These projects are a few of the reasons why Preservation Idaho decided to host their awards ceremony in Sandpoint this year, according to Everhart. The organization tries to alternate its ceremonies between Boise, where it is headquartered, and an Idaho town of special significance. Everhart said the organization has a statewide mission, and members aim to make sure they reflect that as they acknowledge exceptional preservation efforts. Top: The Sandpoint Train Depot, built in 1916, rehabilitated in 2015. Middle: The Nesbitt-Tanner House in all its Boo Radley splendor. Bottom: The Heartwood Center from the original 1908 St. Joseph’s Church. Clark Fork Delta Cruise 1pm @ Kramer Marina (Hope) See where the ice age dam was located that created Lake Pend Oreille, plus learn about the amazing geologic history of how the lake was created. Bingo Night 6:30pm @ MickDuff’s Beer Hall Don’t forget your good luck charms. Line them on the table and talk to them. If they start talking back, maybe you’ve had one too many? Monday Night Blues Jam w/ Truck Mills 7:30pm @ Eichardt’s Pub Weekly infusion of blues and rock from the Man Clark Fork Delta Cruise 1pm @ Kramer Marina (Hope) First Tuesday at Eichardt’s Pub 7pm @ Eichardt’s Pub Monthly live music event hosted by Jake Robin. Live Music w/ Not Quite Punk 9pm @ 219 Lounge Local band of hooligans and rock stars, fueled by Jack Daniels and powerful dreams... huzzah! A DOWNTOWN FAVORITE! Our garden wrap is like a salad without the bowl! A great lunch to pick up on your lunch break or on the go. Call us ahead and we'll have your order ready to go! Karaoke Night 9pm - Midnight @ 219 Lounge Trivia Night 7pm - 9pm @ MickDuff’s Finally, a place to showcase how much useless stuff you know. Finally, a purpose! We’ve gotten a great response to our call for your pet photographs. Instead of putting them in just one issue, we’ve decided to feature one or two every issue as long as we have the space. To submit your own pet photos, please send a photograph and a little bit of information about your special friend to ben@sandpointreader.com. Please put PET PHOTOS in the subject line. co sauce which complemented the potatoes perfectly. We also tried a Beet Wild Arugula Salad that had a great strong dressing, two different types of beets and candied pecans. The Lemongrass Ginger Prawns had a wild orange zest flavor, and the onions had a mild pickled taste that was quite refreshing. Matt ordered the Pho Spiced Seared Chicken Breast and watched us immediately devour his plate. It had an amazing sweet taste. The 24-hour marinated chicken was slow roasted and so moist and perfect. My only critique would be to add more spice, but I’m a fan of dishes that make you sweat. I ordered the Indian Masala Curry with basmati, greens, cashews and grilled chicken. I took one bite and was immediately overjoyed. We can now officially say we can obtain Indian food in Sandpoint, even if just the one dish. The flavors were powerful and merged beautifully. There is not a dish in town that tastes anything like this one. Darian chose the Grilled Top Sirloin, which features a thick, tender cut cooked to perfection with just the right amount of pink. The goat cheese polenta was a nice savory side, and the pickled red cabbage added a pleasing crunch. Cadie chose the House Made Gnocchi, which had a great pillowey texture. It had brown butter, mushrooms, parmesan and chard accompanying it and tasted divine. Overall, it was a very pleasant evening on the deck. The service was a little slow, but that was understandable as Volk was training a staff on the fly, working out the kinks as they came. The food was worth the wait. “It’s been a whirlwind,” said Volk. “I’m happy to be back.” Spud’s is offering their new dinner menu Wednesday through Saturday from 5 p.m. to 10 p.m., and starting in midJune will also offer Sundays. fatty acids. Omega-3s reduce blood triglycerides—high triglycerides can be as dangerous as high LDL cholesterol. Pastured hens also lay eggs with more vitamin E—up to 25 percent more. The amount of Omega-3s in the eggs can also be increased as much as 5 times by adding oils high in Omega-3 fatty acids to the feed. If these things are important to you, read the cartons carefully or buy locally where you can talk to the farmer. Left: Spud’s chef Jessica Volk doing what she does best. Middle: Beet Wild Arugula Salad. Right: Indian Masala Curry. Mmmmm. the old mowing bar. I’ve mowed acres and acres with a mowing bar. From there we thought we moved up, buying an old Owatonna self-propelled swather. Not the best experience—our biggest mistake was putting out the fire when it burst into flames in the hay field. Then we traded for a “newer” self-propelled swather, the one that took the tip off my husband’s finger. Moral: Do not cut hay at the end of a long day at work. On the other hand, we are very happy with the current pull-type John Deere swather. After the hay is dry, we rake it. Here’s where the 60-year-old Ford comes into the picture. It is the smallest tractor we have and runs on gasoline. Many years ago a heavy snow caused the hay barn to collapse on the Ford tractor and the bale wagon, doing neither of them any good. Both were repaired, and though it looks rough, the Ford is our trusted servant. The bale wagon has an idiosyncrasy or two—it is the other machine I want no part of. Done wrong, the stacks of hay will fall when put into the barn. Staking hay is not my idea of fun, but raking hay is, especially with our new hay rake. It’s a very pretty Italian model that I have not gotten my husband or son to let me take for a spin. Rather then rolling the hay over, this rake fluffs the grass so it gets more air and dries faster, and, in the unfortunate event that it gets rained on, it is easier to dry out. The last step is baling, which brings me back to hot, dusty, noisy. It might not be for everyone, but what can I say? I like to bale hay! George Newcomer mowing (swathing) hay. Photo by Diane Newcomer. to “Fury Road.” You have not seen a film like this before. Stylistically, it sits somewhere between steam-punk and western; a surreal combination of “Speed” and the Burning Man festival that’s both beautiful and absolutely out of its mind. It’s a two-hour chase at full speed through the desert that constantly escalates, and just when you’re positive you won’t see anything more outlandish than a flame-throwing guitarist strapped to a wall of amplifiers on top of a semi going 80 miles an hour, Miller ups the ante even further. The fact that almost all of this is done without CGI makes the spectacle all the more jaw-dropping. But beyond the dusty nightmarish spectacle lies what makes “Fury Road” truly special: character. The film eschews Western outlaw cliches and allows issues of gender equality to take center stage, something rarely attempted in a big-budget action film and accomplished here without being heavy-handed or under-played. There’s thematic meat underneath the explosions, and it’s a testament to Theron and Hardy’s acting prowess (as well as the rest of the outstanding cast) that such heavy subtext can thrive through insinuation and facial expressions more than words. “Fury Road” may take place in a universe established by Miller a lifetime ago, but it has plenty to say about the reality of today. A world of fire and blood has never been so hypnotic. growing best in forests where the ground has been disturbed by fires and logging or even campsites. King Boletes can be found in similar areas and sometimes you’ll barely see the caramel colored caps erupting through the dirt and pine needles. When foraging, follow some Golden Rules, take some and leave some, not only for the next guy, but for the next season. Learning to be considerate of the vegetarian in our family of serious carnivores has taught me that there are some pretty delicious vegetable substitutes for meat. Especially the aforementioned fungi. Their season is short, so get out there and get some. Most everything else in the following recipe for Morel Mushroom and Goat Cheese Pasta can be found every Saturday at our Farmer’s Market. Bon Appetit. PREPARATIONS: •MUSHROOMS: Heat the butter and oil in a large skillet over medium high heat. Add the mushrooms and sauté until golden brown and soft, 5-10 minutes. The mushrooms will cook down and reduce in size. Add the garlic and shallots, saute til soft and add the wine wine (it will sizzle a bit) and give it a few good stirs. Add the broth and simmer a few minutes. Add the whipping cream and salt, stir until it thickens up a bit. •TOSS: In a large pot, toss the pasta with the mushroom sauce. •SERVE: Stir in the Parmesan cheese. Just before serving, stir in the spinach and goat cheese. Garnish with chunks of goat cheese, finely chopped greens and the halved, sautéed mushrooms. •Whisk the vinegar and mustard together. •Slowly add the oil, whisking in the same direction all the time, (to avoid air, i.e. bubbles in your dressing), add the lemon juice, then add the onion, tarragon, garlic and parsley and season to taste. Store in refrigerator. *I purchase olive oil and vinegars that I plan to use for just for dressings in small sizes so they are used up relatively quickly and stay/taste fresh, which is key to good dressings (if your vinegar is cloudy, don’t use). Fresh Off the Vine, featuring Lucas Mace (left), Karl Roff (center) and Jesse Ahmann (right). Photo by Brenda Ahearn. band is based in the Flathead ly hard,” he said. “I remember The band works together in Valley, playing gigs often in playing what I felt as first, just composing originals. “Karl does a lot of compoWhitefish, Kalispell, Missoula experimenting. I’m pretty analytical about my improv now, sitions, and Lucas does a lot of and points between. “We’ve been playing togeth- even though it sounds very the originals,” said Ahmann. “I’ll often come up with a meler for about four years now,” free-flowing.” Ahmann uses a pickup on ody after they come up with a said Ahmann. “Most of the stuff we do is instrumental originals. his cello and runs it through a chord progression. It’s a true It’s kind of a fusion between series of pedals for varied ef- collaborative effort.” At the “Live @ The Office” jazz and R&B, with lots of R&B fect. There is an octave pedal grooves. Karl is very good with that drops the pitch down, em- show, listeners can expect a guitar theory, so we do some ad- ulating a big string bass sound. dynamic set of mostly origiAnalog delay and flange pedals nal compositions from the trio. venturous chord progressions.” Ahmann, a classically give the sound an ethereal qual- Doors open at 5:30 p.m. and the show begins at 6 p.m. Tickets trained cellist, recently broke ity as well. into more improvisational muPairing his cello with a are $5 each and seating is limitsic while forming the band. rhythm and lead guitarist, Ah- ed. You can pick up tickets early “Going from classical into mann has found the arrange- at the Sandpoint Reader office a new kind of music is real- ment has been working well. at 111 Cedar Street, Suite 9. By Jodi Rawson For SPR When the boom box shut off during Charlene Rawuka’s second-grade talent show, she sang on. When she moved from California to Sandpoint, she sang on. When Karin Wedemeyer, one of the founders of the Music Conservatory of Sandpoint, introduced her to new languages and a whole new genre, Rawuka sang on. After four years of working with Rawuka, Wedemeyer says “she is a versatile singer from classical to contemporary,” and that “she can absolutely handle opera.” As a European-trained classical singer, she would know. When Rawuka began with Wedemeyer, she thought “it was totally strange. I’m [going to sing in] like Italian, German? What? Not English?’” But Wedemeyer says that her young protégé has courageously accepted the challenges of classical training and working with different languages. Alyce Ispirescu is another phenomenal voice that will be featured on this lovely night. Accompanying them both is master pianist Caren Reiner. For divine music and inspiration, open your ears and heart in the Presbyterian church, 7 p.m. Thursday, June 4. In “Mary” by Janis Cooke Newman, Mrs. Abraham Lincoln finally gets to tell her story. This is historical fiction from Mary Todd Lincoln’s viewpoint, and I found her enigmatic and likable and forward thinking. So what if she held a few séances at the White House and was a compulsive spender. I mean, she lost three sons and saw her husband assassinated. Who wouldn’t go a little crazy? It’s a lengthy read, but a page turner. On the back of Blue Horse, the debut CD by The Be Good Tanyas released in 2000, the Vancouver-based trio pose in clothing from the 1940s, perfectly matching the haunting, beautiful harmonies of the old songs they play—“Oh Susanna,” “The Coo Coo Bird,” and “Rain and Snow.” Frazey Ford, Samantha Parton, and Trish Klein are some old souls of folk who look and sound the part. Except for a couple of documentaries and shows featuring Joni Mitchell, I don’t collect movies. Except for one: “Pollock.” “Pollock” is a film about Jackson Pollock, the tormented American artist of abstract expressionism. It is about his intense relationship with artist wife Lee Krasner and his demons of alcohol, mania and self-doubt. Ed Harris, who plays Pollock, also directed the film. Marcia Gay Harden won an Oscar in 2001 for her masterful performance of Pollock’s wife. It’s not, well, a pick-me-up kind of movie, but it’s still a mustsee. Each week, we feature a new photograph taken from the same vantage point as one taken long ago. See how we’ve changed, and how we’ve stayed the same. Historical information provided and verified by Bonner County Museum staff and volunteers (special thanks to Olivia Morlean, Will Valentine, and Allen Robertson). If you have any scrapbooks or old photographs taken in Bonner County that you would like to see Then & Now’ed, please submit them to the Museum so they can digitize and return the photographs to you. The Museum is located at 611 S. Ella — (208) 263-2344. First Avenue, looking south from Cedar Street. Note that automobiles and horse-drawn wagons co-mingle along the street. The same view today, nearly a century later. To the right you’ll see Weekends & Company and Larson’s Department Store. If you’re being chased by an angry bull, and then you notice you’re also being chased by a swarm of bees, it doesn’t really change things. Just keep running.